There’s no good reason why it took me so long to get around to reading Hans Blumenberg’s Paradigms for a Metaphorology — a 1960 contribution to the Archiv für Begriffsgeschichte that has been available in translation since 2010.1 I’d read around in (a euphemism for “never quite appreciated the significance of”) The Legitimacy of the Modern Age and Work on Myth when they were translated three decades ago and recall discussing Shipwreck with Spectator: Paradigm of a Metaphor for Existence as part of a rapidly defunct reading group of Boston area intellectual historians shortly after it appeared in translation in the late 1990s. But it was only recently, while revising a lecture that I’d given on images of light in Burke’s Reflections on the Revolution in France, that I got around to reading his 1957 article on “Light as a Metaphor of Truth.”2 It led me to Paradigms for a Metaphorology (and, at this point, I will resist the temptation to lie and write something like “which I’d been meaning to read for some time”) and realized that (1) it was quite wonderful and (2) it (shall we say?) “shed some light” on something that intrigued me about eighteenth-century frontispieces: the way in which they depict light. … modern disenchantment does not mean the disappearance of God or the neutralization of theology. Indeed, there is a theology of modern disenchantment: divine is whatever holds the position of the sun in this picture, the smiling source of the light that illuminates a world in which objects appear at rest under the sun. God or reason — both make for a world that appears clearly and distinctly to the man who looks at it. It is as if a certain form of enlightenment (the principle of rendering reason) shared a common structure of bringing things to light with a certain form of religion (the God who shines a light on all things). This format or way of organizing our picture of the world is modern disenchantment (5). But unlike Kosky, my interest in the frontispiece is historical, rather than theological (assuming, for the moment, that there’s a difference). And here is where Blumenberg enters the picture. One of the more important implications of the image of the rising sun is that it allows the process of enlightenment to appear inevitable and, conversely, makes the unenlightened seem, at best, remarkably dense (see the phrase “Light dawns on Marblehead,” a Boston-area euphemism for the moment when, at long last, someone finally gets a point that long ago should have been obvious) if not willfully stupid. These connotations, however, stand in sharp opposition to the change that Blumenberg argues is taking place at this point. Phenomena no longer stand in the light; rather, they are subjected to the lights of an examination [Optik des Präparat] from a particular perspective. As the translator’s note explains, in using the phrase Optik der Präparat, Blumenberg was attempting to capture is the way in which access to truth is achieved through various artificial “preparations” (e.g., experimental apparatuses) that place the truth in the proper light (perhaps Foucault’s account of the “clinical gaze” or his discussion of the relationship between disciplines, knowledge, and power might be relevant here). 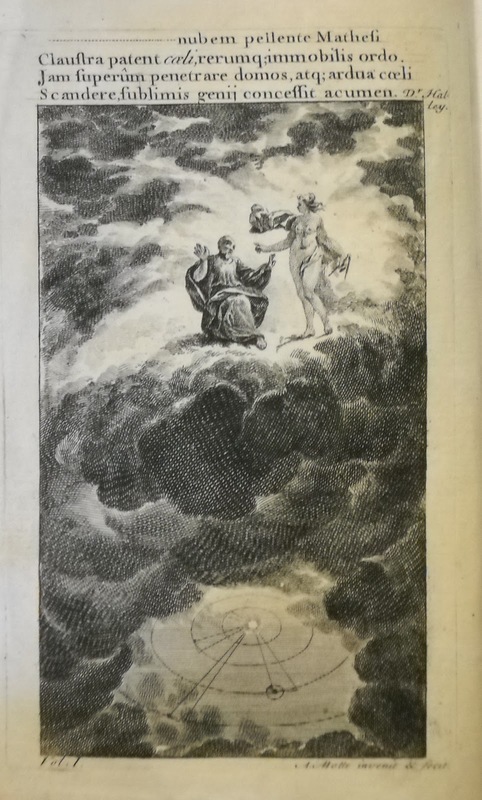 When viewed in this context, what is strange about the frontispiece of Wolff’s German Metaphysics is that it persists in using an allegory for enlightenment that Blumenberg sees as increasingly out of date. It continues to present what ought to be seen as the product of concerted human action as if it were the bestowal of a gift that demands nothing more from human beings than that they wait for a light that descends from above. Nature and Nature’s laws lay hid in night. God said, “Let Newton be!” and all was light. Newton appears here less as the bestower of light and truth than as its recipient. God not only has to make Newton. He also has to enlighten him. We see something similar in the frontispiece to Voltaire’s Elements of the Philosophy of Newton (1738). Light streams over his left shoulder from an opening in the clouds above and is reflected in mirror held by a woman (Truth, again, I suppose, though now in the more earthly guise of the brilliant mathematician Gabrille Emilie du Châtelet) down onto the writing table where an idealized image of Voltaire, her student and lover is hard at work. Newton now holds the calipers and does the pointing and it is possible that Truth (or the Madame du Châtelet) has her eyes fixed on him. But her main concern is with catching the heavenly light that has begun to break from behind the clouds at the proper angle so that her mirror can direct it down on the table so that the marble-headed Voltaire can scribble it all down (and claim credit for it as his own work). 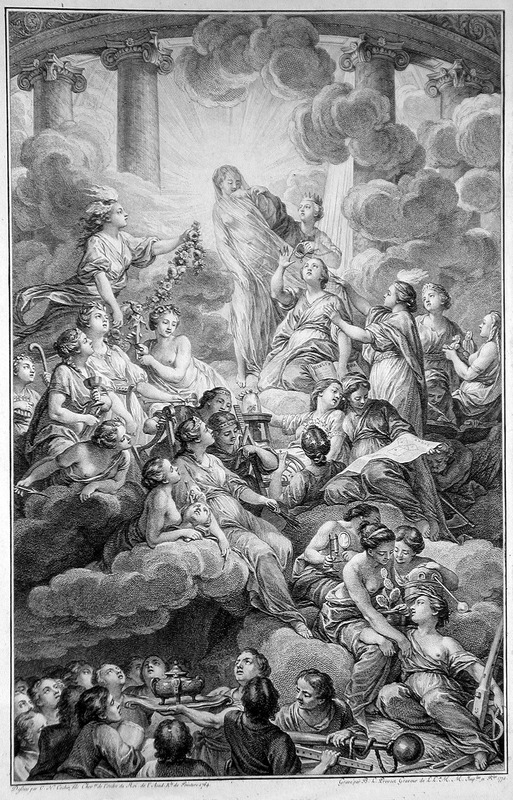 Finally, and perhaps most famously, Charles-Nicolas Cochin’s frontispiece for Diderot and D’Alembert’s Encyclopédie serves up a riot of figures, clouds, and rays of light. Diderot’s explanation of the allegory informs us that the veiled figure at the apex of the composition is Truth, while the figures lifting and pulling away the veil are Reason and Philosophy. 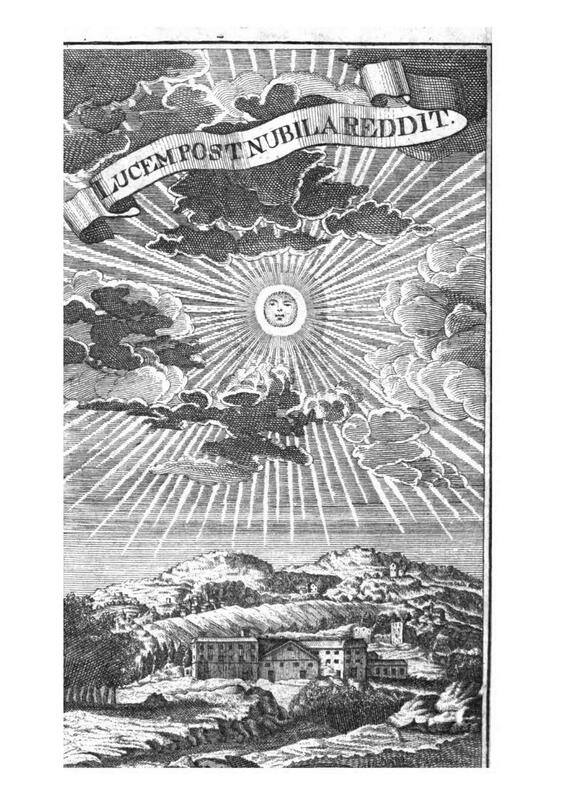 As might be expected, Truth is “radiant with a light which parts the clouds and disperses them.” But to the right of Truth we see a separate shaft of light, descending from the clouds and illuminating the kneeling figure of Theology, who — as Diderot notes — “receives her light from on high.” So here we have two different sources of light: one radiates out from the figure of Truth at the top of the image to enlighten the various disciplines that behold her while another — more focused and discrete — provides a separate illumination for Theology (and is ignored by the figures that sit of her left, busy reading sacred texts and apparently oblivious to everything else that is going on). 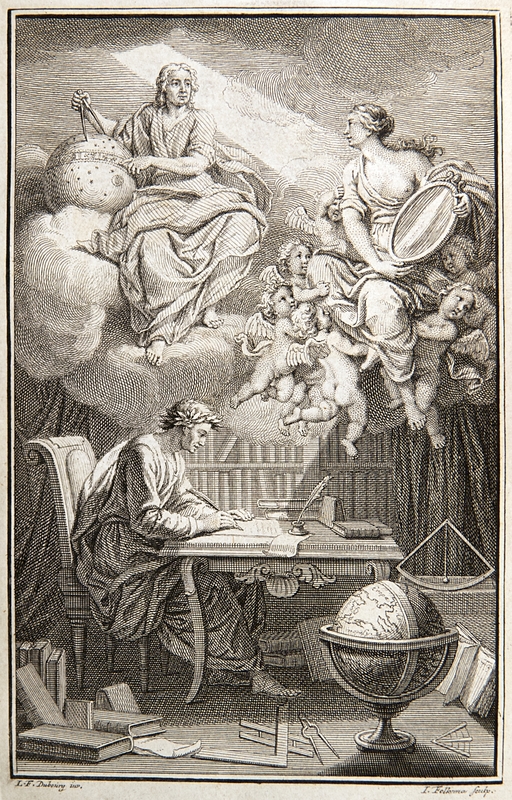 The frontispiece to the Encyclopédie is one of the few eighteenth-century engravings where we are able to catch a glimpse of the contest — which I’ve discussed in a number of earlier posts — that was beginning between “true” and “false” enlightenment. I suspect this can be explained in part by the inherent limitations of the genre itself: it is far from obviously how one would go about representing a light that, rather than enlightening, only plunges us deeper into darkness. 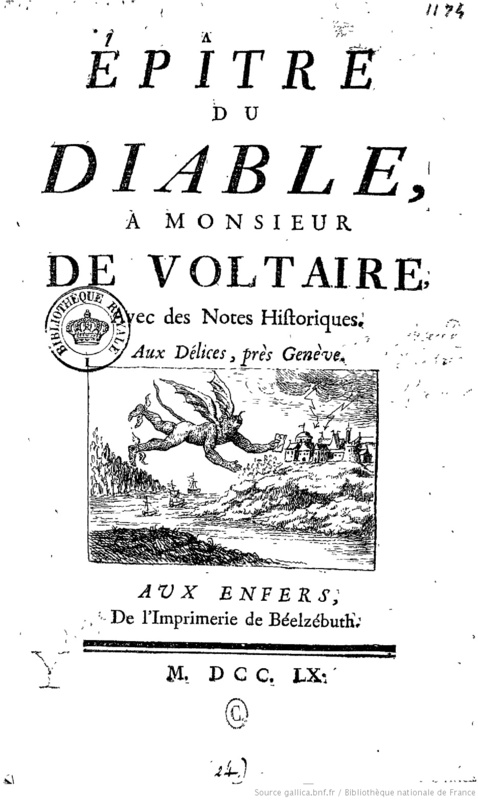 Claude-Marie Giraud’s Epistle of the Devil to Voltaire — allegedly, a collection of Voltaire’s letters with the Prince of Darkness himself — has a wonderful craziness about it, but its charm rests more with the idea that the book was a product of “Beelzebub Press,” a publishing house with a branch at Voltaire’s château in Délices and a main office in Hell (presumably, all contracts with authors must be signed in blood) than with the image on the page itself. For the most part, friends and enemies of what we have come to call the Enlightenment were content to deploy the same set of visual tropes, while varying who was assigned the position of the bringer of light and who hid in the dark. For an example, consider one of the great James Gillray’s weaker efforts: A Peep into the Cave of Jacobinism, his frontispiece for the Anti-Jacobin Review. “Truth” arrives, torch in hand and accompanied by cherubs bearing the Cross, the scales of justice, and the Crown. The rays of her torch shine into the cave in which Jacobinism hides, literally unmasking the Jacobin conspiracy and setting aflame the various writings through which its false enlightenment is spread. While even weak Gillray is better than practically anyone else, there is a considerably more skilled use of some of these same tropes in Smelling Out a Rat, Gillray’s contribution to the war of prints that greeted Edmund Burke’s Reflections on the Revolution in France. But since this post has gone on long enough, I’ll delay a consideration of the peculiar genius of Smelling out a Rat until another time. This entry was posted in Uncategorized and tagged Begriffsgeschichte, Hans Blumenberg, History of Concepts, James Gillray, Light. Bookmark the permalink. I enjoyed this post: it’s a clever way of getting to some interesting ideas about the different notions of knowledge and insight, and what are their sources. Most of the time, those allegorical images bore me to tears, but they did mean something to their audiences! I have to differ with you on your assessment of Gillray’s print, however. Weak effort? I think not. He has plenty of rather formulaic stuff in his portfolio, yes, but this is not one, I think. If it lacks the punch of a masterpiece like Smelling Out a Rat, or the hilarity of many of his other best efforts, it still is, I think, a pretty clever piece of work. It gave him the opportunity to showcase his academic artistic skill, something that he felt was never properly appreciated during his life, and it suits his client and the cause he is serving. The problem for his Tory sponsors with his brilliant works like Smelling Out is that they tend to cut both ways. What political patron wants that? Besides, A Peep is quite a nice little composition, joining the academic/classical/traditional allegorical figure to a gothic/romantic setting, and I think that the juxtaposition of the brilliant maiden with the toad-like Fox/Jacobin under a rock is wonderfully comic. The rays of truth’s light don’t just send the seditious garbage into flames; they positively blow the mask off the little reptile revolutionary. Fantastic details! Just the right tone for a William F. Buckley-type, self-satisfied conservative crowd. I hope to have a post up on Sunday about Gillray’s Peep. As you say, it’s a “nice little composition” and, viewed in isolation, is quite wonderful. 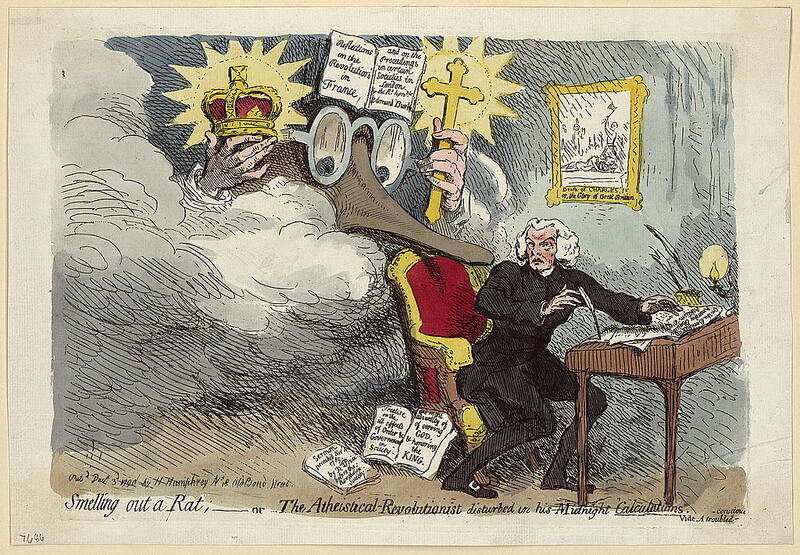 But I still think it’s a few notches below Gillray’s best (and I’ll try to defend that statement in the post). A few notches below his best is quite different than a “weak effort,” so I can’t argue! And as you say, Gillray at his weakest is pretty darn good anyway. Thanks for the very thoughtful comment (and for the reminder about Goethe!). For the moment, I’ll limit myself to noting that Blumenberg saw himself as continuing Cassirer’s general project, so your comparison is quite apt. 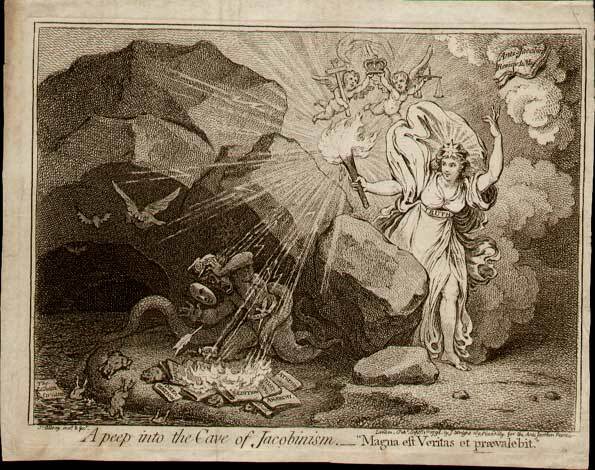 I hope to have something up shortly (classes have ended and I’m able to spend more time writing) that explores Gillray’s Peep into the Cave of Jacobinism using Blumenberg’s discussion of the role of the image of the “cave” in metaphors of truth and light. As you say, Jim, people who illustrate books rarely read them, so those of us who are trying to get at the methodological revolution that the Enlightenment was, rather than its hazy and multi-temporal reception by the general public, probably don’t have to worry too much about all this light unremittingly shed from on high. Blumenberg’s phrase die Optik der Praeparat, however, is gripping. Running quite a way behind you on Enlightenment matters, I haven’t read Blumenberg at all (yet), but what immediately strikes me is that word ‘Optic’. Can any German writer or thinker ever use it without a nod towards Goethe’s Optics, in which he attacked Newton for taking too narrow and passive a view of what human seeing entailed? When the French Enlightenment that was at least partly philosophically inspired by Descartes’ rationalism ran up against a German Aufklaerung steeped in Leibnizian idealism, the question became: so how do we have the clear and discrete ideas we need to get at, or at least measure, truth? And if Leibniz still thought that our intellectual capacity was predetermined from on high, that left a problem for the more sophisticated later eighteenth century of Goethe and Kant, with their sense of a self-steering humanity. Goethe’s point was that there is always a subjective element involved in seeing, and that through tutored or otherwise expanded consciousness we have the capacity to see more and differently. His optics were partly epistemology. I’ve been using Frederick Burwick’s The Damnation of Newton: Goethe’s Color Theory and Romantic Perception (1986) to try to understand what’s at stake Generally these ruminations point me in two directions. One, towards the feeling that optics as a new branch of science, rather more than the enduring metaphor of light, is materially involved in what stimulates the Enlightenment. And two, that the later Aufklaerung, in which Kant reacts to Humean empiricism and Goethe reacts at once to Newtonian empiricism and Kantian idealism, develops a notion of reason which is always in close partnership with imagination. (Hence, In Kant’s case, the three critiques, each of them of a form of reason.) 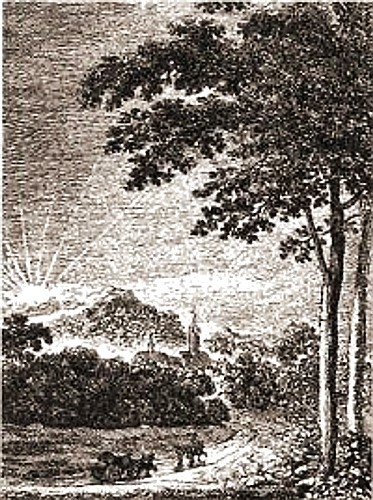 It’s that persistent element of imagination that means that later thinkers like Blumenberg, with an interest in the religious and the symbolic,can always find new starting-points in the German eighteenth century, and in that sense they might easily be seen (like Ernst Cassirer) as carrying on in the Enlightenment spirit in the twentieth century. Although Cassirer wrote his own history of the Enlightenment which establishes the link, this is purely intuitive on my part about Blumenberg, since, as I say, I haven’t read his essays, just a few brief paragraphs about him. But it would be my starting-point after reading this terrific blog. Just one more reference before I sign off. Burwick refers to Werner Heisenberg, no less, weighing in to sort out the Newton-Goethe controversy in ‘Die Goethische und Newtonische Farbenlehre im Lichte der modernen Physik’ Geist der Zeit (1941) XIX, reprinted in Wandlungen in den Grundlagen der Naturwissenschaft (1959). It strikes me, as a prelude to getting hold of the book, how steeped in late eighteenth-century German philosophy this work by a great twentieth-century physicist sounds. Once again the possibility of more Enlightenment continuities suggests itself.. Thanks for these thoughtful remarks – they make me want to go back to Blumenberg, whom I’ve not read as carefully as I should. I think the woman holding the compasses in the preface to Newton is a personification of Mathematics, who has just driven the clouds away (nubem pelllente Mathesi…, as the verse by Halley has it). I’m indebted to you for pointing this out. It makes a great deal of sense, and the personification of (and assignment of agency to) Mathematics fits rather nicely into the general point I was trying to make about how these frontispieces seem to be working with what Blumenberg would view as the earlier (i.e., “pre-Enlightenment”) version of the light as truth metaphor (“Mathematics” drives away the clouds for Newton, as opposed to Newton’s having to invent the calculus in order to clarify how the heavens operate). Thanks, but the only one of these images that would have been accessible out “on the street” would have been Gillray’s Smelling Out a Rat, which (if I’m remembering what I read in Nicholas Robinson’s Edmund Burke : A Life in Caricature) was displayed in the front window of Hannah Humphrey’s print shop. The rest would have required ownership of the books in question.